Liverpool FC has extended their 19-year long relationship with MBNA. For almost two decades MBNA has issued the Liverpool FC credit card as the Club’s official provider. As part of the renewed relationship, they will now become Official Partner of Liverpool Football Club in the UK. Billy Hogan, Managing Director and Chief Commercial Officer at Liverpool FC said: “We have enjoyed a long standing relationship with MBNA over the last nineteen years and are delighted to extend that partnership into its third decade. 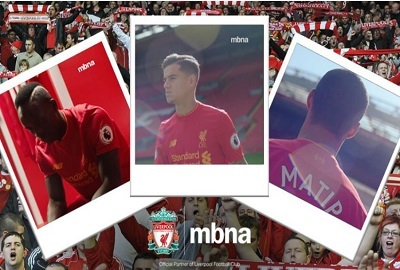 James Poole, Strategy and Innovation Executive at MBNA said: “We’re using our special connection with Liverpool FC and its legendary supporter base to provide a valuable programme of benefits that make good stuff happen for the real fans of the game.